During the Empire Strikes Back, one scene would inspire the in-depth backstories of five bounty hunters. 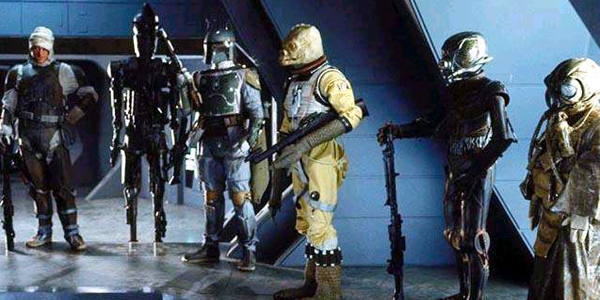 These five bounty hunters, who included IG-88, Dengar, Zuckuss, 4-LOM, and Bossk, meet alongside the infamous bounty hunter Boba Fett with Darth Vader. Vader tasks the bounty hunters with finding Han Solo and the Millenium Falcon. Although only Boba Fett and a few others would reappear in the film and subsequent finale, the others would not. In the coming years, their backstories would be expanded through books and other media. Below we’ll shine some light on who these bounty hunters were. The bounty hunter Bossk was a Trandoshan from the planet Trandosha. Standing at nearly two meters tall, Bossk resembles a humanoid reptile. Bossk operated during and after the Clone Wars and was the son of an infamous wookie hunter named Cradossk. During the Clone Wars and the infancy of Boba Fett’s career, Bossk would accompany the bounty hunter on many assignments throughout the galaxy. Although Bossk was a notoriously ruthless bounty hunter, he did follow the Bounty Hunter Code that made him a fair combatant and honest businessman. Dengar was a male Corellian human known for his excellent tracking record, combat prowess, and crudeness. The bounty hunter began operating during the era of the Clone Wars and was a member of the bounty hunter syndicate Krayt’s Claw, which included Boba Fett among its members. He was known by other bounty hunters as crude, slovenly, and arrogant. Dengar would often prefer to engage head-on with hostiles as opposed to other bounty hunters that preferred cunning. The bounty hunter 4-LOM was originally a protocol droid designed by Industrial Automation that had a defect in its programming. This defect led 4-LOM to become a feared bounty hunter that was not only unfeeling but also highly ambitious. He was known to work closely with the Gand bounty hunter Zuckuss. His characteristic insect-like head was designed to resemble the insectoid species he was originally meant to serve. Zuckuss was a male Gand bounty hunter that stood at a meter and a half and resembled an insect/humanoid hybrid. He operated as a bounty hunter prior to and during the Galactic Civil War and was known as a proficient tracker. Zuckuss claimed to have the ability to feel disturbances in the force that he used to his advantage. The bounty hunter was known to regularly work with the protocol droid bounty hunter 4-LOM and referred to himself in the third person. IG-88 was an assassination droid designed by Holowan Laboratories that went on a fatal rampage moments following its activation. He used the lingering fear of violent droids following the Clone Wars to become one of the most feared bounty hunters in the galaxy. IG-88 was a hostile rival of Boba Fett. During the hunt for the Millenium Falcon, IG-88 followed his rival to Bespin where the latter nearly destroyed the assassination droid.